Mid-summer means we are mid fire season, so staying safe is a must during the fire danger period. While parts of our community work hard to keep us safe and informed, others have been less than helpful. Explore the issue in this compilation of our hot-weather stories. MANNINGHAM Council is set to launch a new Emergency Aware program which will empower local communities to prepare for the impacts of various emergency situations. The program, which will be delivered in partnership with emergency service organisations, will aim to help local residents develop home emergency plans, and work together so they can be better prepared for the effects of fires, floods, storms and other emergencies. Mayor Paula Puccini said that the support of the local emergency services partners and local residents was vital to the success of the initiative. “It’s great to see these organisations, the Council and local residents coming together to create a stronger and more resilient community,” Cr Puccini said. 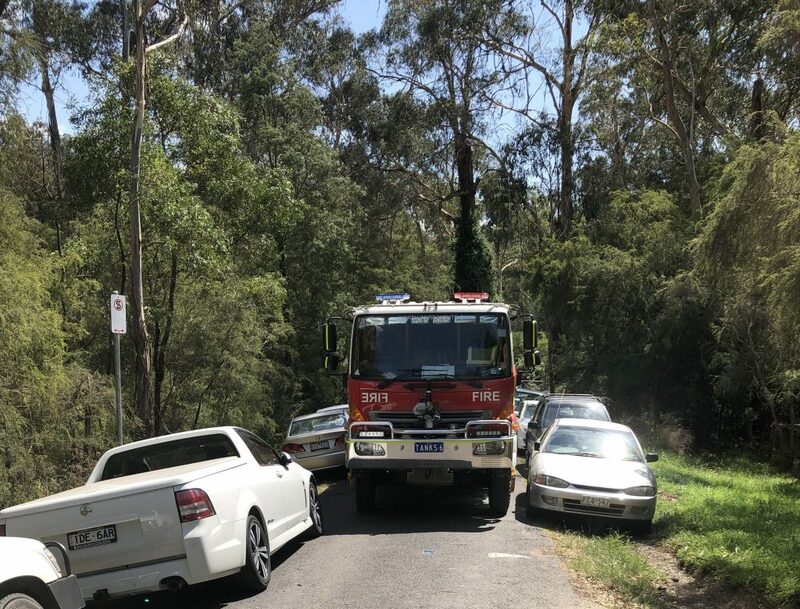 While Warrandyte’s natural beauty is among its best features, it also leaves our community especially vulnerable to bushfires, making the prospect of an emergency plan even more necessary. A recent report published by the SES shows that home emergency plans greatly reduce the impact of an emergency and help those affected recover quicker. With the aid of the program, Warrandyte’s locals will hopefully be relieved of some of the stresses that come with summer’s scorching heatwaves, knowing they are better equipped to handle potential bushfires. Cr Puccini said she encouraged all residents in fire or flood prone areas to get involved in the innovative pilot. “Emergencies affect the whole community. “This program reinforces the importance of working together to plan and prepare for emergency events,” she said. The program will see the Council work together with emergency organisations, such as the CFA, MFB, Victoria Police, and the Red Cross, to help residents implement preventative strategies. To find out more about the program and how to get involved call 9840 9333. 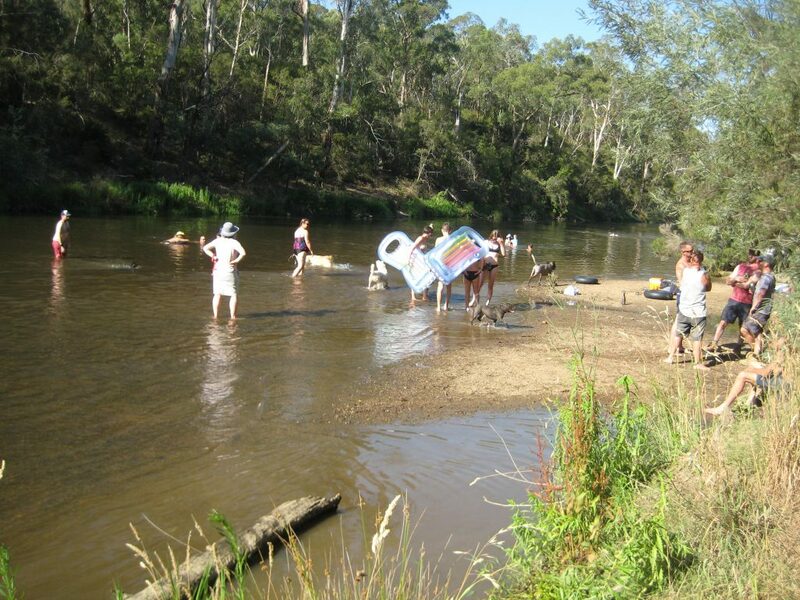 Hot weather brings tourists flocking to Warrandyte to engage in the age-old tradition of swimming at the Pound. Not satisfied with having a dip under the bridge or at the tunnel, swimmers have been heading to more secluded areas of North Warrandyte. The lack of infrastructure at these locations leads to visitors’ cars blocking roads and, dangerously, impeding access for emergency vehicles. There were several high fire days in early January, and the North Warrandyte Fire Bridge reported major difficulty accessing Normans Reserve. Captain of North Warrandyte CFA, Trent Burriss, told the Diary that there were many cars parked along the roadside. “We just squeezed through, I had to fold some mirrors in… there was also a car parked across the gate,” he said. Despite Parks Victoria closing the parks, many visitors ignore the signage and park in no standing zones. People just don’t care, they come from out of the area, I don’t think it is locals that are doing it, that is the hardest things. But we get a few people fined and then those people don’t come back, and the next people who come down do it,” he said. He says the parks all along the river are having the same issues. Capt. Burriss says there are more emergencies than just fire when swimming in the river. The Brigade took to social media to try and warn of the risks of blocking access. He thinks that a tow away zone may be a deterrent, however policing the hot-spots needs to be a priority. Station Officer at the Warrandyte Police Station, Sergeant Stewart Henderson, said the local police have been patrolling regularly and, since the early January incident, “are pleased to report we haven’t come across any further instances”. Capt. Burriss wants people who come to Warrandyte on Total Fire Ban days to exercise caution. “I know they are trying to stay cool — but go to the beach or something — don’t come to one of the highest fire danger spots in the world,” he said. AS WE MARK the 10th anniversary of the Black Saturday bushfires that devastated communities throughout our Green Wedge, CFA Captains are calling for better education for families in our bushfire-prone areas. North Warrandyte Captain Trent Burriss told the Diary reaching new residents can be difficult. “There have been lots of houses for sale, a lot of different people coming into the area — it is a different generation that are moving in now,” he said. New residents come into the area and are unaware that summer in Warrandyte means being ever-vigilant against the threat of bushfire. “Unfortunately we can only educate the people who want to be educated, but it doesn’t matter how hard you try,” Warrandyte CFA Captain Adrian Mullens told the Diary. Capt. Mullens recounted a recent phone call with a resident who was unaware how to respond to a Total Fire Ban day. “When this guy said ‘we have been here twelve months, my wife is the only one that drives and we have got five kids, how do we know if there is something happening?’; when you get phone calls like that it really makes you start wondering,” he said. For the record, Capt. Mullens’s advice to his caller: “CFA recommends, on a bad day you make a conscious decision to leave the night before or first thing that morning, don’t wait around until you see smoke and flames, because that is too late”. Capt. Mullens says a good idea is to educate the children first. Locals have also been called upon as volunteers for the CFA, but as Capt. Burriss said to the Diary, the brigades struggle to keep up with recruiting. “The hardest thing is that, and they don’t have time to commit to the fire brigade, and we are a commuter suburb so people go out to work and they just come here to sleep because house prices are higher, meaning they have to work,” he said. Local CFA brigades offer community education sessions throughout the year, you can also join your Community Fireguard group, and ensure you have a range of options for staying informed during the fire season, such as the Vic Emergency App, the CFA website, or listen to ABC 774 Local Radio for emergency broadcasts. Check out the Be Ready Warrandyte website, warrandyte.org.au/fire, for tips on making a fire plan for your family. WITH WARRANDYTE experiencing many days of temperatures above 40 degrees Celsius this January, Facebook has gone into meltdown with complaints about the heat, power outages and traffic delays. Tuesday, January 15 was one such day and Warrandyte made the Channel 7 News on two fronts. 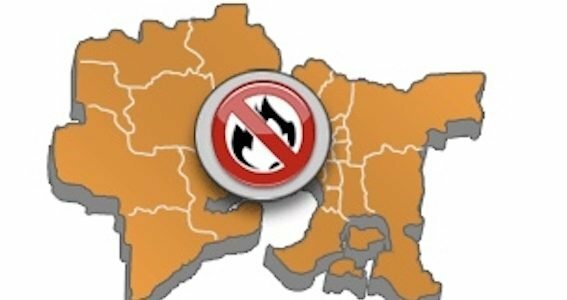 With the Fire Danger Rating for Central District classed as Severe and a Total Fire Ban in place, AusNet Services went ahead with an all-day planned power outage affecting around 500 residents to do remedial work in Aton Street and Osborne Road. Affected residents, who had received prior notification, had realised that this was going to be a difficult day and had been phoning and writing to AusNet for a number of days beforehand asking them to reconsider and reschedule the work. Jillian Garvey talked to AusNet on January 12 and was advised that it hadn’t been cancelled and would go ahead unless a Total Fire Ban was declared. Despite the community uproar, the planned work did go ahead. In maintaining the safety and reliability of the electricity network, we are very sensitive to the need to balance the short term impact of maintenance or upgrade works with the long term interests of the community. In very hot weather we normally review all planned works requiring customers to be taken off supply, to try to achieve this balance. On Tuesday, January 15, (a declared Heat Health Day and Total Fire Ban day) approximately two thirds of all planned outages on our network were postponed. The large planned outage affecting 446 customers in North Warrandyte needed to go ahead however, primarily because the work involved was bushfire mitigation work. Safety regulations give us less discretion to re-schedule these kinds of works. We thank affected customers for your patience and understanding. These decisions are not taken lightly, and are made or reviewed at very senior levels within the company. We remained mindful of the impact on customers (many of whom contacted us to express their concerns), and were able to complete the work (which included the replacement of three poles in Osborne Road, the installation of multiple bays of new overhead line, and some other works) and restore supply some two or three hours earlier than originally estimated. The same afternoon a major accident occurred on the Fitzsimons Lane bridge between a bus and a 4WD, closing Fitzsimons Lane completely and causing massive traffic diversions in the area. Again, hundreds of posts were made on social media, with local residents reporting traffic delays lasting hours on the eastbound approaches to Warrandyte. A major complaint was traffic attempting, unsuccessfully, to take shortcuts through local streets. On Friday, January 25, another 40+ degree day with Severe Fire Danger and a Total Fire Ban, power outages hit Warrandyte and surrounding areas. In the morning it was the turn of around 3,000 properties north of the river to lose power due to a fault, although this lasted less than an hour. In the afternoon it was the turn of those south of the river experiencing one of the many load-shedding outages due to failure of supply against demand, and this lasted less than two hours. generally critical of State and Federal Governments; particularly as Victoria’s Energy Minister Lily D’Ambrosio had assured us earlier in the day that there would be no risk of blackouts. This should serve as a warning to all residents that on hot days — and there may be plenty more to come this summer — we may find ourselves without power. Everybody’s Fire Plan needs to take this into account. Remember that a temperature forecast of 33C for Melbourne can mean a temperature approaching or exceeding 40C in Warrandyte. And whilst some chose to vent their fury on social media, others sought cooler places such as shopping centres, cinemas or took a leisurely dip in the Yarra. 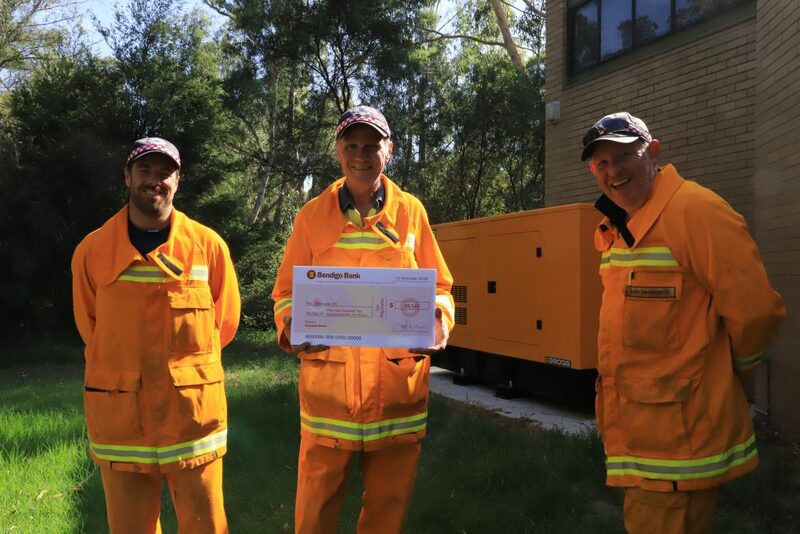 Warrandyte Fire Brigade have ensured they are able to remain operational in case of blackout, thanks to a generator purchased with a grant from the Warrandyte Community Bank. The significant grant of $39,545 from the bank has allowed the brigade to install a 90kVA power plant to run the station in the case of a power outage. Until the generator was installed, blackouts meant the firetrucks were trapped inside the station. Captain Adrian Mullens told the Diary that the automatic doors can only be raised by the electric motor. “Our engine bay doors are electric, so our pagers go and ‘boom’ the doors come up, if the power is out we can play around for ten minutes to try and get doors open,” he said. The crew has to remove the door from its hinges to get the doors open. “That adds significant time to our turnouts, and we are under a fair bit of pressure to get a truck out the door within four minutes,” he said. The generator will now allow the station to remain fully functional during blackouts. “If the power is to go off now within 10 seconds the generator starts up. could only run a few lights, that thing runs the whole station and we have got a little bit up our sleeve”. Capt. Mullens said that to have the ability to keep the station operational during prolonged blackouts was a major consideration. “When we have members here waiting to go out on strike teams and the power goes out, we need to be able to continue to have power to run the doors, the radios and other appliances,” Capt. Mullens said. In the event of a major incident power could be down for days or weeks, meaning that the station could become a lifeline for the community in the face of a Black Saturday level event. “With the generator, we could continue to run the station as long as we can continue to supply fuel. “The technology for solar and batteries to run three-phase is not there, so we felt the generator was the only way to go,” he said. The last part of the installation is to put up a screen to help it blend into the surrounding landscape. Despite the large outlay, Capt.Mullens says that he hopes there is no need for it. “Hopefully it doesn’t get used,” he said. THE DIARY have teamed up with Swinburne University and the CFA to produce a series of animated fire safety videos. The resultant videos will be launched on the Diary’s website and social media channels, so watch out for them over the coming months. 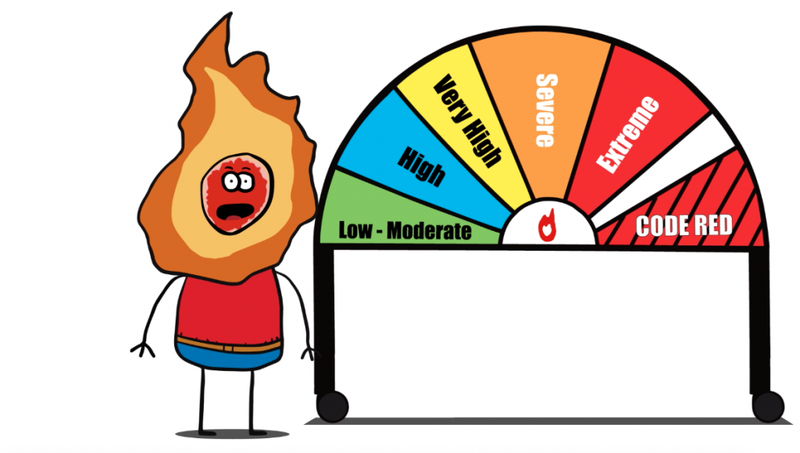 http://warrandytediary.com.au/fire-safety/Our first video is up now, and explains the fire danger rating system. Other videos talk about pet safety, preparing your property, using fire blankets, and fire safety for young children. 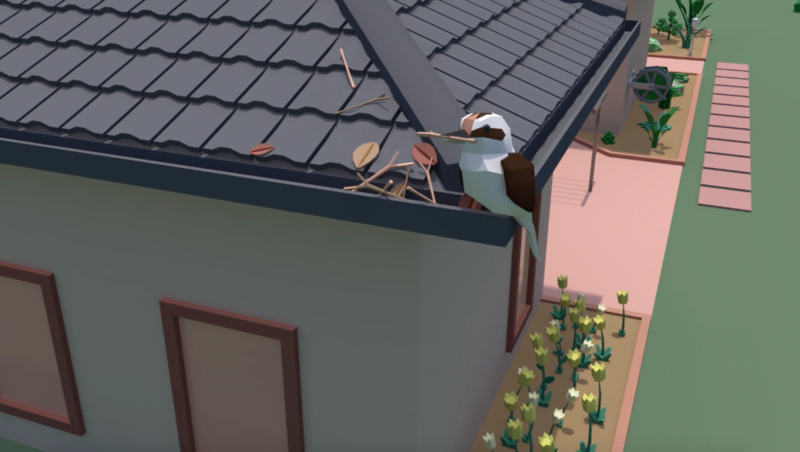 “We are blown away by the really out-of-the-box ideas these guys have come up with,” says CFA Region 13 Community Education Manager, Rohan Thornton. Jaime Kroupa has lived in Warrandyte for around 15 years, and is one of the animation students at Swinburne University. “It was great working with the Diary and CFA guys as ‘clients’ on our projects, it was great to have the feedback as we went along,” said Jaime. She says being a Warrandyte resident gave her a better understanding of fire danger than some of her more urban cohort. “I live only a couple of streets away from Flannery Court, and when the fire hit in 2014 I was at home, we expected the danger would be more in the bush areas around North Warrandyte, so we were a bit shocked when it happened so close to us,” she said. Jaime’s video was a stand-out amongst the nine videos produced for the Diary, and we look forward to showing you her work later in the year. She is still midway through her course, and she hopes she will finish in two years’ time with a Bachelor of Animation. From there Jaime hopes to be able to work with some of the big Melbourne based animation studios, so she can work on feature films.